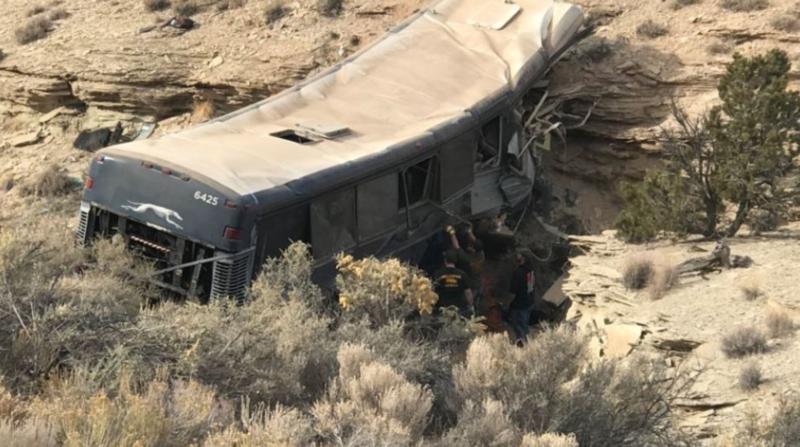 SALT LAKE CITY -- A Greyhound bus careened off the highway in Emery County, Utah, on Monday, killing a 13-year-old girl and injuring 11 others, CBS affiliate KUTV reports. Investigators are still trying to determine what caused the crash along Interstate 70 west of the city of Green River. However, a passenger reported a possible medical issue with the driver, the Utah Highway Patrol said in a news release. The bus was heading west across the desert from Green River to Las Vegas, Trooper Jared Cornia told The Associated Press. It went off the shoulder of the highway around 11 p.m. and plunged into the wash, crashing about 200 feet from the highway. The bus driver and two passengers were transported to hospitals by helicopters in serious condition. The victims were sent to hospitals in Grand Junction, Colorado, and Provo, Utah. Eight other injured passengers were taken to the hospital by ambulances, Cornia said. The roads were clear and conditions were good and were not believed to have been a factor in the crash, Cornia said, adding that investigators were trying to obtain video from a camera on the bus to help determine what happened. Lanesha Gipson, a spokesperson for Greyhound, said the company is cooperating with authorities and conducting its own investigation. Gipson did not have information about the driver.